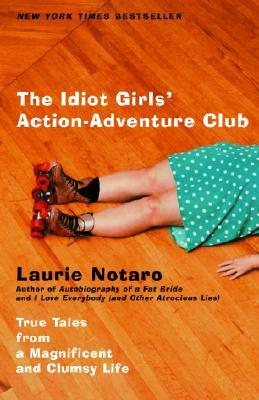 Introducing Laurie Notaro, the leader of the Idiot Girls’ Action-Adventure Club. Every day she fearlessly rises from bed to defeat the evil machinations of dolts, dimwits, and creepy boyfriends—and that’s before she even puts on a bra. For the past ten years, Notaro has been entertaining Phoenix newspaper readers with her wildly amusing autobiographical exploits and unique life experiences. She writes about a world of hourly-wage jobs that require absolutely no skills, a mother who hands down judgments more forcefully than anyone seated on the Supreme Court, horrific high school reunions, and hangovers that leave her surprised that she woke up in the first place. The misadventures of Laurie and her fellow Idiot Girls (“too cool to be in the Smart Group”) unfold in a world that everyone will recognize but no one has ever described so hilariously. She delivers the goods: life as we all know it. Laurie Notaro is a humor columnist for the Arizona Republic at www.azcentral.com. She has been fired from seven jobs (possibly eight) and lives with her first husband and pets (two dogs—a miniature Wookie and a lab that makes doody in her sleep—and a cat with no teeth) in the hot, dry dust bowl of Phoenix, Arizona. The Idiot Girls’ Action-Adventure Club is her first book.